Today at Everything Easter Egg-stravaganza we created lists of ideas of things you can place in your child’s Easter baskets. We also have a FUN Easter Basket filler giveaway, be sure to enter for your chance to WIN. Did you mark your calender to join us at the ONLINE Live Easter Egg-stravganza on April 6th 1:00-3:00PT? Don’t miss the fun MOMversation and your chance to WIN great prizes. Yesterday we talked about Creative Easter Baskets – Next comes choosing the fun creative filler ideas. Which for me can be challenging with the age range of children in my home – I’ve created Two different age level lists to assist us in filling our Childrens Easter Baskets. 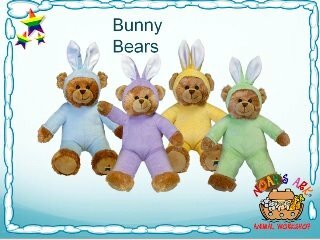 MojosWorkshop@247moms My Stuffable Bunny Bears are perfect for Easter Baskets, and only $13 each! www.mojosworkshop.com (See in my pic)Kids love them! mommyimhome@247moms I’m using a new Hannah Montana beach towel as Easter basket filler this year for the 8 year old. FunWithMojo.com is proud to announce our newest addition to the Noah’s Ark Workshop family. Our fabulous “Bunny Bears” collection features an adorable teddy bear in your choice of 4 color options of bunny clothing – Purple, Lime Green, Bright Yellow and Baby Blue. Each soft and fluffy teddy bear is “dressed” in the colored outfit complete with bunny ears that can be pulled down like a hoodie. They’re the perfect size for filling up your Easter Basket or as a stand alone gift. Bunny bears arrive at your door unstuffed packaged with stuffing for a fun “bring your animal to life” activity perfect for kids of all ages. I was scouring the internet for Easter basket ideas. I’m so glad I found your blog! You have a ton of great ideas. I really love the Bunny Bears. My daughter would be in serious love if she saw one.